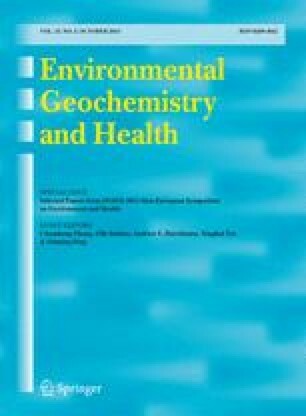 The study of gold sites in the Migori Gold Belt, Kenya, revealed that the concentrations of heavy metals, mainly Hg, Pb and As are above acceptable levels. Tailings at the panning sites recorded values of 6.5–510 mg kg−1 Pb, 0.06–76.0 mg kg−1 As and 0.46–1920 mg kg−1 Hg. Stream sediments had values of 3.0–11075 mg kg−1 Pb, 0.014–1.87 mg kg−1 As and 0.28–348 mg kg−1 Hg. The highest metal contamination was recorded in sediments from the Macalder stream (11075 mg kg−1 Pb), Nairobi mine tailings (76.0 mg kg−1 As) and Mickey tailings (1920 mg kg−1 Hg). Mercury has a long residence time in the environment and this makes its emissions from artisan mining a threat to health. Inhaling large amounts of siliceous dust, careless handling of mercury during gold panning and Au/Hg amalgam processing, existence of water logged pits and trenches; and large number of miners sharing poor quality air in the mines are the major causes of health hazards among miners. The amount of mercury used by miners for gold amalgamation during peak mining periods varies from 150 to 200 kg per month. Out of this, about 40% are lost during panning and 60% lost during heating Au/Hg amalgam. The use of pressure burners to weaken the reef is a deadly mining procedure as hot particles of Pb, As and other sulphide minerals burn the body. Burns become septic. This, apparently, leads to death within 2–3 years. On-site training of miners on safe mining practices met with enthusiasm and acceptance. The use of dust masks, air filters and heavy chemical gloves during mining and mineral processing were readily accepted. Miners were thus advised to purchase such protective gear, and to continue using them for the sake of their health. The miners' workshop, which was held at the end of the project is likely to bear fruit. The Migori District Commissioner and other Government officials, including medical officers attended this workshop. As a result of this, the Government is seriously considering setting up a clinic at Masara, which is one of the mining centres in the district. This would improve the health of the mining community.